As of today, Disney owns the rights to the X-Men, which means that the current mutant-centric movie franchise is likely due for a reboot. Sadly, that means the existing cast will be out of work, but at least the fans have already decided who they’d like Professor X himself, James McAvoy, to play if he ever hopped over to the DC universe, after the actor picked himself a role with the Distinguished Competition. McAvoy donning the Riddler’s green bowler hat would fit with a running theme in the actor’s superhero movie roles. After portraying Charles Xavier and The Beast in Split/Glass, it’s clear that the Scottish star enjoys playing characters with some sort of extraordinary mental abilities. If he played Edward Nygma, he’d be embodying the Batman villain known for his genius-level intellect. 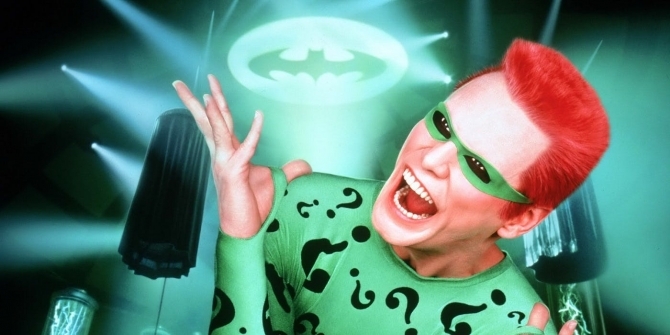 Luckily for McAvoy, Warner Bros. may be looking for a Riddler right now. Director Matt Reeves has reportedly selected the Prince of Puzzles to be the secondary antagonist in his upcoming film The Batman, with the Penguin filling the part of the main villain. McAvoy might have competition, though, as many other actors have either been suggested by fans – see Simon Pegg or Tom Hiddleston – or have put their own names forward for the part – like Sebastian Stan and Chris Hemsworth. Plus, for now, James McAvoy is still Professor X and you can see him in the role again when Dark Phoenix arrives in theaters on June 7th. Hopefully by then, we’ll know a bit more about where Disney intends to take the franchise.